This page is designed to lay out the expectations of the academy, the parent and child. Please read it carefully and initial the registration form to agree to the terms of the agreement. A. First and last month’s tuition are due at the time of registration. A one-time $15 registration fee (or $25 family registration fee) and a $3.25 per student insurance fee are applied in addition to the tuition payment. B. Tuition will be due on the 1st of the month. Late fee of $15 charged to your family account on the 15th of the month if payment is not received. Credit Card and check payments will have an additional 2.75% fee unless enrolled in automatic withdrawals or paying the entire season in full. If a check is returned, there will be a $25 fee added to the family account. If a second check is returned, the parent must be in cash for all future fees. Payment in full also gives a 10% discount on the annual tuition. C. SESSION PAYMENTS: For any program sessions, payment is due in full upon registration. Payment plans can be made, if necessary, upon approval of Miss Desiree. Complete payment must be made by the midpoint of the session. Cash only accepted for program sessions. D. Students will not be able to participate in any outside events or performances/recital if there is a balance on the account. NO EXCEPTIONS! Student dismissal will result if the account accumulates two months of tuition. E. NO REFUND POLICY: The monthly rate is fixed regardless of the amount of classes in the month. Please refer to the MAD Academy Calendar for closings. Only in the event of serious illness, injury or extenuating circumstances are we issuing refunds for class. Make up classes will be provided for classes cancelled not due to a holiday. F. Performance team and Master Education Classes are paid separately. Please frequently check your email for updates on auditions, payments etc. G. Volunteering and Donations: Our studio’s mission is to provide everyone with the opportunity to explore our arts programs. If you would like to help fund a student’s education, please contact us via email. Students, parents and our community family are more than welcomed to volunteer to reduce tuition rates or to simply help our studio flourish. Please contact Miss Desiree for more information. We appreciate and thank you in advance. 1. Black leotard and pink or flesh colored footless tights are preferred for all dance and gymnastics classes. Black capri leggings, pants or shorts above the knee are fine but cannot be loose fitting. Barefeet are required for all tumble and gymnastics classes. The knees must be visible to the instructor for all dance and gymnastics programs. 2. Hair must be neatly kept away from the face for all programs. Hair is not to be touched once class begins. Tiaras, hats, headbands, or other hair accessories are not allowed or anything that may be distracting to the instruction. Please have extra hair ties and hair products on hand to keep your child’s hair in place for the duration of their instruction. 3. Ballet slippers and tap shoes are required for our Dancin’ Roots, Sacral Styles and Solar Plex Rays Combo classes. Tap shoes with elastic straps are best and safest for young dancers. Please be mindful that wearing tap shoes outside is harmful for the structure of the shoe. 4. All hip hop classes will need street sneakers to participate. Our skate program requires sneakers as well, however flat sole sneakers are best for performance (ex. Vans, Converses, Adidas-like shoes). 5. NO jeans or inappropriate clothing will be accepted on the dance floor. The student will have a “sit and watch” day if these circumstances arise. 6. Please have a dance bag for young dancers with all dance belongings labeled for easy shoe transitions. There should only be dance class necessities, water and a snack in the bag. Please leave toys, dolls and any other distractions at home. 7. ROYAL SHREDDERS SKATE PROGRAM: Students must bring their own skateboard and helmet. Elbow pads are recommended, but not required. As mentioned, sneakers are required, specifically flat sole sneakers are ideal. We do not have a strict dress code as skating is about the art of free expression, however we ask that your child is able to move comfortably as they will do a great deal of stretching and jumping. Sagging pants are not accepted so please make sure a belt is worn during this physical activity. Bring water bottles as classes are held outdoors. We are a family unit. We are a team consisted of parents, dancers, visionaries and team leaders. We will treat one another with love and respect. A positive, nurturing environment will be maintained to ensure we are encouraging growth. We will encourage one another and help one another stay focused to ensure a beneficial learning experience for all. a. Lateness: Respect is a huge deal here at MAD Academy. We want to give each child an equal opportunity to focus their minds and feel confident in their learning. To ensure this, students who are later than 10 minutes will not be allowed to dance for that day. However, dancers will be able to sit and watch to allow them the opportunity to mentally engage in the lesson. (For combo classes, dancers will not be allowed to participate in the style they are entering in after 5 minutes of it beginning, however they can jump into the class when the style of dance changes.) Gymnasts will not be allowed to participate after 5 minutes late for their safety. b. Absences: If a dancer is going to be absent, please notify us if possible. Make up classes are only for classes cancelled by the studio. Please be mindful that constant tardiness or absences are detrimental to the learning experience and the ability of the child to feel confident and focused in the learning setting. Please communicate to us if transportation is an issue to see if we can help. c. If conduct becomes a consistent issue for the child and/or the parent, business will be terminated and the student will be dismissed from the program. No refunds will be given. The student can complete the classes for the remainder of that month with permission from Miss Desiree. d. Parents are NOT allowed in the instruction area. Students are to be dropped off at the door with a team member. Parents are welcome to watch their child from outside the instruction area if possible. We want our students to know they are safe with us. There are no exceptions. e. Students must use the restroom prior to class beginning. Students will not be allowed to use the restroom until class is over or shoe swap time comes. This is to cause fewer distractions and to ensure they are getting the most out of their class time. Please help us make the best of our instruction time and ensure they are prepared to begin promptly at the start of class time. f. Snacks are welcome and encouraged particularly for students taking many classes. We will have a designated snack time for combo class dancers. Please put the snack in the dance bag. Peanut free and messy-free please. WATER ONLY! All snacks eaten outside of the designated time must be eaten outside the instruction room. Concession stands to support our MAD family will be coming soon. 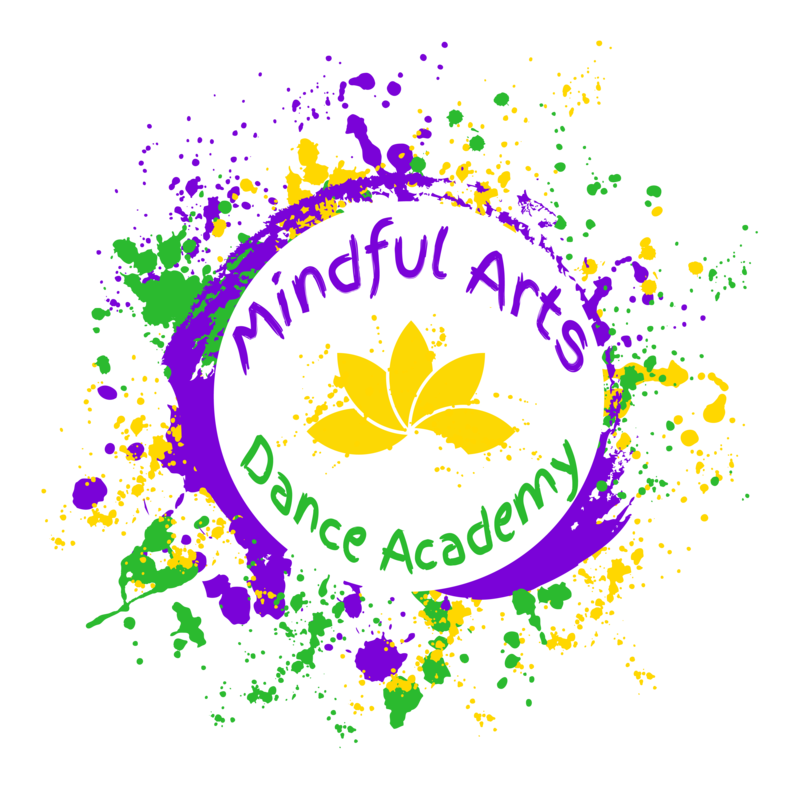 Mindful Arts Dance Academy will participate in a yearly recital. Information on dates, costume fees, and location will be provided via email. Costume fees are nonrefundable, however, should you decide not to participate, the costume is yours to keep. We strongly urge all students to participate as it shows the hard work put into the season.